If you have already done some comparison shopping or read some reviews of the best water softeners on the market, then you already know that Fleck makes what are probably the most trusted and recommended water softening systems that you can buy these days. They have build a reputation in the industry as a brand that is know for making high quality units that last you for many years and remain trouble-free while they are in use. In fact, you probably won’t even need to use the 5-year warranty that come with most of their products. 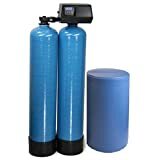 The company who manufactures the Fleck brand is Pentair Water Treatment, and if you do any research on them you will quickly see that they are highly recommended and rated with tons of positive ratings and feedback from happy customers. It’s no surprise that they are the industry leader when it comes to the highest quality water softening systems for homes and businesses. They do make a few different models, so keep reading to learn about them and see which might be the best fit for your family’s needs. We’ve already mentioned what a great reputation this brand has in the industry, but if you’re not convinced yet then let us share a few more benefits of using Fleck water softeners in your home or business. Eco-friendly – these units use less salt than standard units, which is great for the environment. They also require less energy to run. Affordable – with different models available, you can choose one that best meets your water needs and budget. Easy Setup – getting the unit setup is a breeze since it comes with everything that you need and is already assembled upon arrival. You can probably even do your own installation instead of calling in a professional. Easy to Use – With the electronics control, it is easy for anyone to operate the unit – even if you have never used one before now. WQA Certified – this means that you know that you’re getting a quality piece for your home. It is easy to see why Fleck is a trusted brand by so many plumbers and home owners. As you may already know, this model is one of the most popular not only for Fleck but out of all brands of water softeners. The capacity for this unit is 48,000 grains and it can treat up to a 12 GPM flow rate. Fleck recommends this unit for homes that are experiencing a hardness level of medium to very high. You’ll get the best results from this unit if you meet that level of hardness. And, it is designed to support a household of three to six people, for optimal results. The Fleck 5600SXT is a digital metered on-demand valve that has a bypass valve and 1-inch threaded plumbing adapter. It is easy to use and easy to install. And best of all, it is affordable. Like all Fleck water softeners, this unit has high capacity extra long life resin, which means you get a lot of value for the money. And the meter based regeneration means that you aren’t wasting water since it measures your usage and only regenerates when it is necessary for it to do so. Other features include a backlit LCD display, 48 hour power backup in case of a blackout, easy to use touch pad controls and an interface that is very user friendly. The brine tank does use pelleted salt. And if you are going to install this thing on your own, expect it to take around one to two hours total. If you want something that is a bit of an upgrade from the 5600SXT model, then you’ll definitely want to take a look at the 7000SXT model by Fleck. It is designed for both residential and commercial use. Right now, you can buy it in either a 48,000 grain capacity or a much bigger 64,000 grain capacity. The larger capacity model gives you a lot more hard water processing power, but both models feature the newest Fleck valve – the 7000SXT. Overall, this is a pretty robust option, regardless of which grain capacity model you go with. The Fleck 7000SXT is designed to deal with the heavier water use that comes with a larger home, a business or a large family of five or more people. It features some advanced technology, a soft water brine tank refill, double backwash, optical positioning and flexible programming. On the valve body, you’ll find connect clips which are very easy to use. Overall, this is a great unit that can handle the demands of heavy water usage. If efficiency is of utmost important to you, then you will definitely be happy with the Fleck 9100SXT model. It was designed with maximum efficiency in mind. It accomplishes this with its twin tank system that converts your hard water to soft water with minimal waste and energy use. Since it has the dual tanks, you never have to worry about running out of soft water as they alternate as needed. 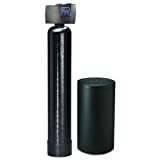 That makes the Fleck 9100SXT whole house system a great water softener for a large family or house. It is also very effective at treating water with a very high hardness level. You get a high flow of 12 GPM and maximum efficiency when it comes to salt usage and water waste. It is very easy to install and includes the On-Demand Flow meter so that you are only regenerating when needed since it measures the usage of your home to identify patterns and eliminate waste. Other features include digital metered control, LCD display, touchpad controls, and high capacity resin in each tank. It has a capacity of 48,000 grains and can easily be installed on your own without the need of a plumber. On average, it takes between one and two hours for installation. At the end of the day, any of these Fleck home water softener systems are a great choice for your hard water problems. They work well, are easy to install, offer maximum efficiency and can handle very large homes, households and even businesses. 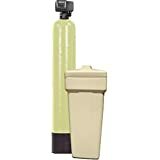 Based on their high quality and good brand reputation, when you buy a Fleck water softener, you know that you are buying something worth your money.